Det amerikanske energiministeriums vejledningsfaciliteter er defineret som " historiske ejendomme af national betydning", der bedst kan formidle og fortolke omfanget og betydningen af Manhattan-projektet, og give den grundlæggende kerne for ministeriets evne til at fortolke, hvad enten det er på stedet eller gennem museer eller andre fortolkende indstillinger, sin beskrivelse af Manhattanprojektet som udviklede atombomber under Anden Verdenskrig. Se også: Manhattan Project National Historical Park. 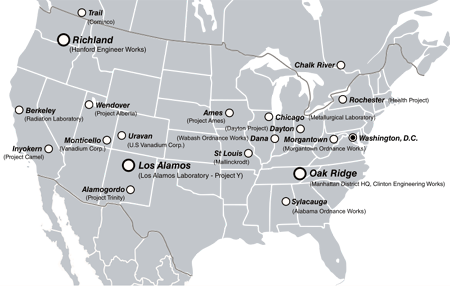 Manhattan Project Sites: Draft Special Resource Study / Environmental Assessment. - Washington, DC : Nationa Park Service, U.S. Department of the Enterior, 2009. - 216 s.
Third Five-Year Review Report for Formerly Utilized Sites Remedial Action Program (FUSRAP) St. Louis Sites. / : U.S. Army Corps of Engineers, St. Louis District Office, 2015. Formerly Utilized Sites Remedial Action Program. The long-term problems of radioactive contamination discussed in the FUSRAP Report are examples of the more general long-term radioactive contamination effects of nuclear power generation and nuclear weapons. The Chernobyl disaster and the Fukushima disaster have both left large areas of land which will be dangerously contaminated for many thousands of years. Nuclear power generation in general produces very long-lived radioactive waste products, and the problem of safe storage or disposal of these products has not been solved. The problem of radioactive contamination associated with nuclear weapons is greater still. A nuclear war would leave very large areas of the globe permanently uninhabitable, and would affect both belligerent and neutral countries.